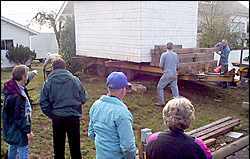 OCTOBER 10, 1998 - There's been much talk lately about building a new prison south of Junction City near Milliron Road; but today Junction City's very first "prison" got a new lease on life as it was moved to the lot where the Pitney house is being restored. Here's how it came about. On May 31, 1873 one of the first contracts let by the newly incorporated city was awarded to Thomas Humphry to build a city prison. Mr. Humphry's bid was for $84.33. The prison was built on the Northeast corner of 8th and Greenwood Streets, about where the current library's parking lot is, where it remained until the thirties. 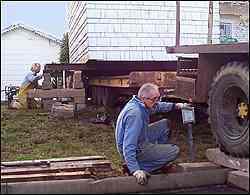 In 1996 it was re-discovered on a piece of property recently acquired by Guaranty; and the Historical Society began plans to have it moved to the lot where the Pitney house stands. 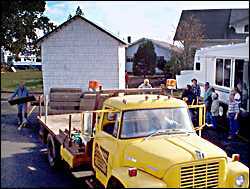 On Saturday, October 10 1998, with the help of Guaranty and Chris Shoap House Movers, all their plans came together as the "prison" was moved to it's new location at 4th and Holly Streets. The 10' x14' one room prison is constructed of rough cut 2x4s that are laid flat, one on top of the other, forming solid walls that are six feet high. There are 4 windows that measure 10'' x10''. There are six iron bars in each window. Legend has it that the first prisoner was sent to the slammer for disobeying the no swine at large law! (There is no firm evidence that this is true - but it makes a great story! A foundation will be built and the building placed on it in the near future. The public is invited to view the building from the ally behind the Pitney house. 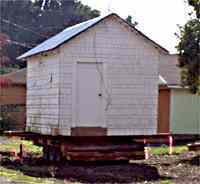 It will be refurbished (along with the Pitney house) by volunteers and eventually opened to the public as an extension of the museum. The "prison" rounds 4th and Greenwood. Home alone!